Recently one of my chickens went broody. You can see the story here. I decided to put my egg candling experience on a separate page, so here it is! I’ve had the eggs since 5/4/05. We’re not sure how old they were when they arrived, but we were told that they wouldn’t really start developing until a hen was sitting on them which was two days ago. I’ve never done this before so I wanted to candle a store bought egg to use as my egg candling benchmark. Here Is my Egg Log. Remember, I’m not exactly sure how old these eggs are, so I’m going to say that Thursday, 5/4 is Day 1 (the first day she was on the eggs all day). Today is Mother’s Day! What a great day to candle eggs and see if my hen is going to be a mother. I candled all of the 7 eggs. The three big eggs seem to all have well formed webs of veins. The 4 smaller eggs didn’t seem as developed, but all of them had what looked like developing chicks. We actually saw a tiny little beating heart in one of the large eggs. I tried to take a video, but it didn’t really come out very well. I’ve been reading that some people don’t like to handle the eggs too much, so I’m not sure if I’ll continue to candle every day. Curiosity may get the best of me though. Oh, today at church a friend (the one who gave us our original chicks) mentioned that one of his hens was broody and sitting on some eggs. One of the eggs exploded under her (eggs get bacteria in them which grows and builds gass / pressure) and so they discarded all the other eggs. They went to the feed store, picked up some chicks and put them under her. She didn’t miss a beat and raised them as her own. If things don’t work out with our chicks maybe this will be a good option for us. I took out all the eggs again and carefully candled all of them with my wife. Good news: we verified that all 7 eggs have moving little chicks inside. So far so good! One of the smaller eggs had an embryo that was moving so much that we decided to take a video. See the video below of the chick moving around. Look closely and you can probably see some little feet kicking! I tried to candle three eggs yesterday and I didn’t see a fraction of the movement as I had in the videos. I’m hoping it is because it is getting too crowded in the egg to do the chickie boogie and not that they are sickly / quitting. 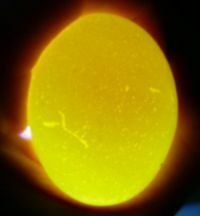 It did seem that I saw more of a chick silhouette in the egg which is pretty cool. Another thing I noticed was “floaties” in the egg. Pieces of something that was floating / sinking independent of anything else. I wonder if this is normal. We pulled out all the eggs tonight to candle them. It is probably the last time we will candle them since they will be hatching in a few days or so. The eggs were VERY dark except for the air pockets at the big end of the eggs. 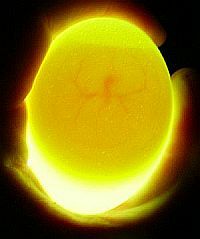 A few of the eggs looked as though a little bump was protruding from the dark mass into the air pocket. We looked closely for movement in each egg, but it was hard because they were so dark. For the most part every egg seemed to have at least a little bit of movement. One egg was especially dark and as I was rolling it to look for movement my wife pointed out a tiny little crack that looked like an X on the egg. This is so exciting! For the rest of the story go HERE! 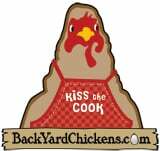 Please visit my site http://www.backyardchickens.com/ for a ton of great info on raising chickens. YES YES YES YES YES!!!!!!!!!!!!!!!!!!!!!!!!!!!!!!!!!!!!!!!!! !I’m hatching-again!!!!!!!!!!!! !I read a post on back yard chickens about fertile eggs at WHOLE FOODS!!!!!!!!!!! !We have a whole foods NEAR US!!!!!!!!!!!!!!!!!!!!!!!!!!!!!!!!!!!!!!!!!!!!!!!!!!!!!!!!!!!!!!!!!!!! !I told my dad about it,and he doesn’t seem to have an objection,unless we keep them past four weeks.That’s bad but OH MY GOODNESS!!!!!!!!!!!!!!!!!!!!!!!!!!!!!!!! !But I TOTALLY forgot how to hatch eggs over the months.Any tips? It honestly didn’t seem that long to me on my first hatch.Great news:I have a week off from camp so I have Wed.,Thurs.and Fri.unshceduled.Maybe one of those days we can go to whole foods and pick up the eggs!Now,to get my old incubator working……….. ARRRRRGH!!!!!!!!!!!!!!!!! !After 4 months of silence,I come back here w\all my problems.I really hate to be a bother,but where can I get a incubator.My old bator has been through lightning,lots of rain and exxecsive heat.I doubt it works.And please do not tell me about building a bator!I cannot build anything to save my life.So,what do I do? I have the nastiest hens ever. They pecked at my arms and hands when I tried to reach into their laying box. So, I now use an old ragged insulated shirt and cover the hen, lift her out of the box by her body, set her on the ground while I get eggs, candle them etc and then lift her back onto the nest. By the time she decides to complain, she’s back. Works great! 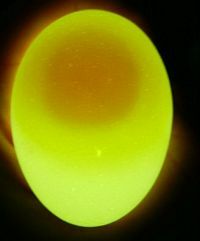 Rob,I think you should know that the hatching section in your forum (BackYardChickensForum)is overflowing with stuff about candling eggs!About fifteen members (including me)set eggs two days ago and are so anxious to candle! !One even went ahead and candled.Please go on BackYardChickens and see what all the commmotion is about! My eggs don’t look likie that. Its like day 12 or 13 or 14 and there is a huge dark spot on the top with red veins coming off of it. i candled different. 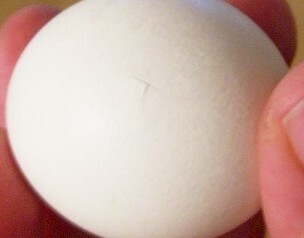 Oh my i think one of my eggys cracked! What do i do! I am sooo excited! I got some chicken eggs from my science teacher and I made my own incubater and have been candeling them every three days or so. there gettting so big! 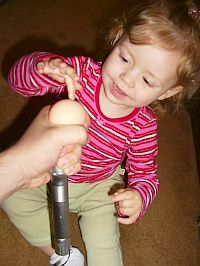 I was wondering some of my chicks have difficulty getting out of it”s egg what is the average time it takes for a chick to hatch? And I have tried to help them out by peeling away the shell but then the membrane gets stuck to them and dries and makes it to where they can’t move, so I tear the membrane gently but then it starts bleeding and making a mess and the chick usually dies. Should I stop helping it and just let nature take it’s course? If anyone has any answers I would appreciate them thanks. I found an abandoned nest with a single egg in it. It’s quite small and it’s not a chicken egg. I’ve had it in an incubator for about 4 days now under 100F. I’ve tried candling it but i don’t see much except for the yolk in the middle. Can you give me some advice and maybe put up some pictures in how to candle properly and how to tell whether the chick is alive or dead. If any one can help me out please let me know! hey over there!!!! I have been a member of BYC for about a year and have eggs on Day 18. There is no fog on the glass from humidity is that bad? There’s usually fog. Well I have two chicks now. When do I move them to the brooder? Thank you for putting your photos and technique on the web! I have a flock of mixed brown egg layers and one barred Wyandotte rooster. Early this month two hens went broody–an Australorp and a Brahma. We tried to continue collecting the eggs as usual, but finally the terribly sad expression on the face of the Brahma each time I took the eggs got the better of me. The trouble is, the pencil marks indicating the eggs to remain with the brooders wears off, particularly under the Brahma for some reason, so tonight I couldn’t tell half her eggs apart. According to my book, twenty is a bit too many eggs for even a large hen to manage. If isn’t big enough to cover all the eggs, as she rotates from inside to out, the outer ones can get cold and die. You could lose the whole clutch. 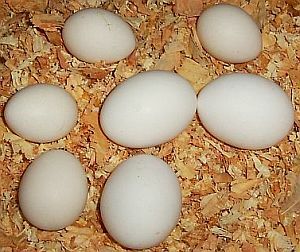 Carla Emery says 14 eggs for a large, well-feathered hen, eight for a bantam or poorly-feathered one. My eggs usually stop wiggling so much after day 14. They are just huge masses that I can’t look into. I almost chucked two that I thought were dead but I kept because I though a few days longer in the incubator wouldn’t cause any harm. Those two eggs did hatch, they were alive and healthy. 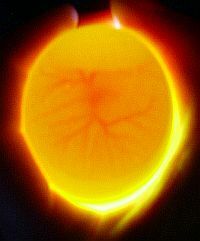 I love watching the eyes in eggs rotate to see the flashlight when I shine the light in. I have to google candling to get my full though. I read handling them to much decreases the chance of them hatching because the oils on your hands rub on the eggs. Washing your hands is great but you know washing with soap doesn’t wash away all the germs. Thank you for all the cute chick stories and egg pics! Rob, if you’re still on this site, I need your help. I’m thinking of hatching again but can’t find much good info. Where can I get good info? Okay, I’m taking the incubator for a “test run”. I placed a store bought egg inside to ‘incubate’. Is it possible a chick could be growing inside? Just wondering. Hi, just found this site while looking for how to candle eggs, I’m 12 years old and I got a small incubator for Christmas. I love chickens and this will be my first incubation not by hen. 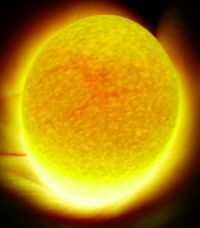 I candled it with my Dad’s strong LED flashlight, 12 days and all I see is the airpocket dark and a dark shape in th middle like the yolk or something, is it fertile, PLEASE HELP, I’m desperate. I just figured it would be nice to have a chicken forum where you can get questions answered (and just chat with other chicken freaks). Does anyone know of a forum like this?Nothing too slow,please. It drives me nuts when there’s only 5 members online at any given time and the last post in a section was made a month ago. so I open my incubator to candle them and it stank! day 14. I candled a egg that had a black mass on top and whenever i moved the black blob also moved. also this egg is cracked i think there was black goo or yelow at bottom of incubator. Do i take it out? I’m 13 and this is my first time hatching eggs! I’m so excited! But my 3 year old brother unplugged my bator and it was only day two….how much damage did that do? And there is also orange globby stuff on the outside of one of the eggs….what is it? EWE! If anyone can help please reply! Please send me informattion about how to make incaburater and its operation, Egg checking tenchiques vial email. Ok, so how can I tell if my eggs were too far gone. What I mean is that my hen was sitting on 21 eggs in a place where she could in no way take care of them after they hatched. I moved all 21 eggs after the first one pipped. Only 5 hatched. I now have 4 eggs that I tried to get another hen to sit and they still haven’t hatched. In fact the new hen layed 13 more eggs and now I don’t know which is which. I have candled them, all 17. I can’t tell which is which and I don’t want an explosion in my incubator. Help Please. I candle my eggs and it’s day 21 and I hear chirping. But the thing is that the chick inside the chicken egg is still tiny. What is wrong? I’m scarred that none of them will hatch, but I am keeping my faith in Christ. Hey Im 13 and this is my first time incubating eggs. I have 14 eggs in all, (11 chickens-marans and amaracaunas) and 3 ducks. When I candle them, they look pretty small but there are little veins and embryos. But the thing is, they seem to be surrounded by a circle but the embryos and veins are still there. There is no fowl smell but I see no movement an the eggs are at day 14. I REALLY don’t want any to explode in my incubator cause I worked really hard. Also, some of the eggs have wet-looking spots on them. I keep a steady temp of 99-100 degrees but it goes down to 97 every once and a while. Are my chicks alive? I was wondering if you would allow me to link one or two of your candling pictures for my blog. I’m discussing candling burrowing owl eggs at a zoo, and your photos are some of the best out there for seeing the progression and what to look for. Hey Anne, thanks for the note. Sure, go ahead and use the images but please attribute and link back to this page. Hey guys I’m incubating eggs for the first time! I have 9 eggs, but only3 look fertile. Should I take out the ones that don’t look fertile!? I am incubating chicken eggs for the very first time and I need your help! I put nine in the old homemade bator, but only 3 look fertile. I don’t want any to explode! Should I take out the ones that don’t look fertile or leave them? My incubator is a styrofoam cooler and my temp. Is always 99.7 and my humidity is usually about 42%-57%. I am so thankful for your help! I just wanted to have your opinion! Please answer!!!!! It going to be day 17 tomorrow!!! Ahh! What do I do?!?! If you can guarantee there non fertile then just remove them but if you cant be positive then don’t risk it as you may loose out in a chick ! While I’m here I have had a chick with rye diease anyone got any way of helping cure this basically means my cream egg colour chick rests its head on its back and walks backwards quite a bit anyone help on that one ? How does an egg explode in an incubator?!? Hi! I have hatched two eggs now. I helped both and both were fine! The one wasn’t even pipped on day27 so I cracked it and there was a beautiful, living, peeping chick! I named them Spinner and Twister! I’m new at hatching eggs. I have two fully fertilized chicken eggs but when I candle them there’s no air pockets and I can’t tell if they are breathing or not. Any suggestions?